Announcement of task force meeting talk at CCFE. 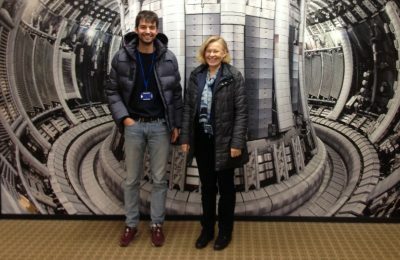 In this regard, two of our Fusion team members, Mervi Mantsinen and Dani Gallart, participated in the modelling and analysis campaign during the 4th-15th of March at JET. This campaign was particularly useful to gather the experimental team members and share information and last results. In order to take advantage of the presence of the large number of scientists during those two weeks, several meetings were organised. In one of the meetings, Dani Gallart gave a talk on a task force meeting about the heating differences arising from changing a plasma composition from T to DT. This is an important aspect to take into account since these differences that have been found will most probably apply to both flagship plasma scenarios under development: baseline and hybrid. 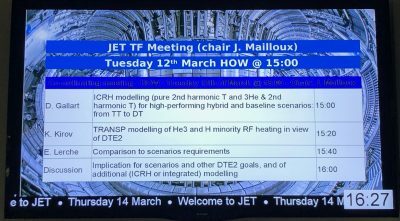 At the moment, JET is going to be the closest test for ITER relevant scenarios in DT in preparation of ITER operation.